Incursion is another Kodi addon that lets you stream movies, shows, and various other categories of video content on your PC, smartphones, and Amazon Fire TV Stick. Incursion boasts of a solid collection of content including a number of latest movies, award-winning shows, recent episodes, documentaries and a lot more. This addon is built upon another immensely popular addon called Covenant. This is why you will find a number of similarities between the two including the interface and the folder layout. The content collection is also much the same. But, Incursion Kodi Addon is built using the updated codes and hence is expected to offer certain performance enhancements over its predecessor. Incursion, like other best Kodi addons, does not host any content of its own. But, it fetches multiple streams for a video from the most trusted sources. This makes sure that there is always a working link from which you can play the video. Streams are available in both full 1080 HD and 720 HD. Let us now learn how to install Incursion Kodi addon on your PC / smartphones / FireStick. UPDATE: Incursion is not getting any updates and not worth installing. It hardly fetches any streams, hence, we have stopped updating this guide. I suggest checking my list of popular Kodi Addons that are working fine on the date. 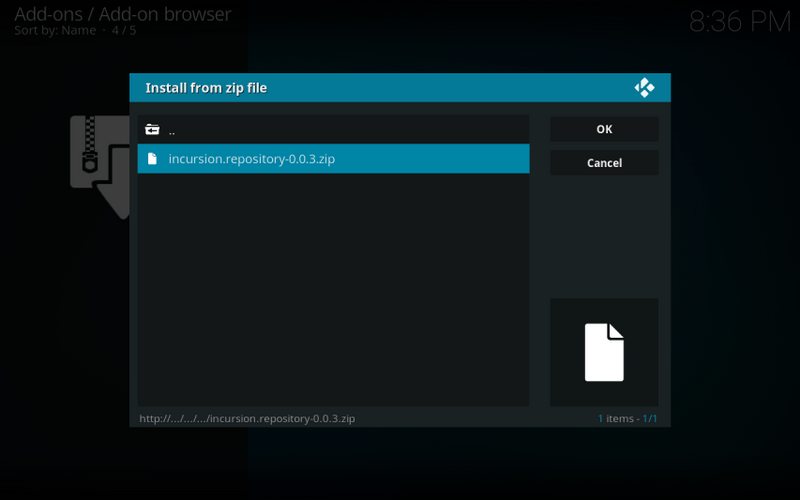 Before you start installing Incursion on Kodi 17.6, let me show you how to prepare your Kodi app for third-party Addon installations. Your Kodi app is now all set to accept third-party add-ons such as Incursion. Follow the steps below to install Incursion Kodi addon on your Fire Stick, PC, or smartphone. Type “Incursion” in the source name field. You can name it whatever you want, however, it is best to keep it relevant. Go to Kodi home page and open “Add-ons” menu from the left options. Wait for the success notification on the top right. Once repo is installed, proceed to the next step. Click “Install” to download and install Incursion Kodi Addon on your device. Wait for some time and you should see the notification “Incursion Add-on installed” on the top right of your screen. That’s all. Go to Kodi homepage > Add-ons > Video Add-ons > Incursion. You can explore the addon now. Incursion is available through its own ‘Incursion’ repository. The server in which the repository resides is efficient and works well for the most part. However, on some rare occasions, the server goes down resulting in installation issues. If you are not able to install Incursion Kodi addon from the server, there is a fair chance that the problem might be at the server end. You will either face difficulty adding the source to Kodi or you may not be able to install the repository. Server downtimes are always on the radar of the developers and hence they are fixed rather promptly. As a user, the only option is for you to wait for the server to become operational again. Server, however, is not the only factor that causes the installation issues. The problem may even be local. Of course, the first thing to make sure is that your device is connected to the internet. Try using some other app that requires internet. Once you have ascertained internet connectivity, I would suggest rebooting Kodi as well as your PC / FireStick / Smartphone. After the restart, follow the installation steps from starting. Rebooting may rather seem like an oversimplified solution, but sometimes it miraculously fixes certain difficult issues that other troubleshooting methods cannot. The servers are often the culprits when it comes to problems related to addons. As I said before, Incursion server good and works just as well as any other popular addon’s server. But, it does run into troubles at times. As a result, users are not able to fetch the streams or the videos do not play. If you are trying to use Incursion Kodi addon at the time of a scheduled server maintenance or downtime, it will not work. When there are server issues, the only way is to wait out and allow the server to become operational again. In the event Incursion is not working at all, the server may not be the problem. It is likely that there is a local issue, preventing Incursion from playing. Again, make sure FireStick is connected to the internet. If Incursion Kodi addon stopped working after a period of use, one or more of its files may have gone bad or corrupted. In such a case, reinstallation is usually the only way to fix it. 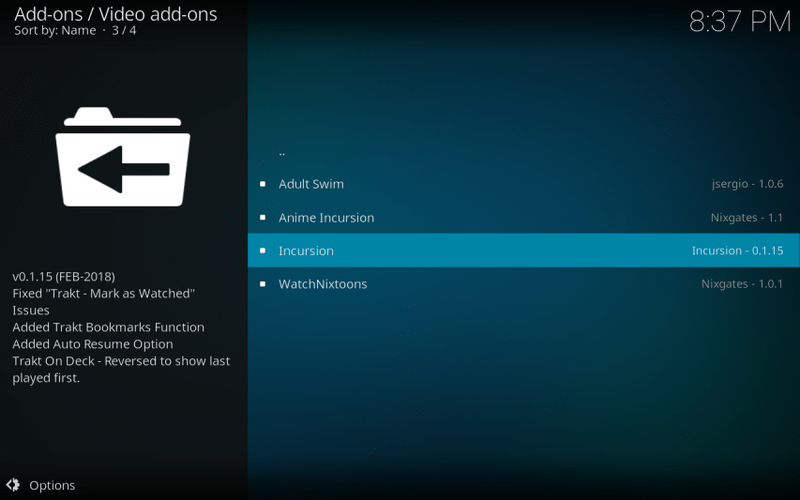 From the Kodi home-screen, navigate to Add-ons > Video Add-ons and select Incursion. Click the ‘Uninstall’ button on the bottom right. Now, go ahead and install Incursion following the method we have shared with you above. There is a great chance this will fix the problem and get Incursion working again. Of course, rebooting remains as one of the primary troubleshooting methods. Quickly restart the Fire Stick /PC and run Kodi again. Rebooting refreshes the OS, system files and the apps and resolves many problems. If none of it seems to be working then you may have to reset Kodi on FireStick / PC or uninstall and reinstall it. Resetting or uninstalling Kodi will wipe out all your data and addons. So, back up the Kodi data before you take these actions. Incursion should be sufficient for most of your needs, however, if you want to get more top Kodi Addons, check out the links below. Incursion is a Kodi addon that allows you to watch your favorite movies, shows and other videos on your FireStick. Incursion uses the Covenant framework and hence it looks a lot like this popular addon. Of course, Incursion has the updated codes and hence it also offers enhanced performance. 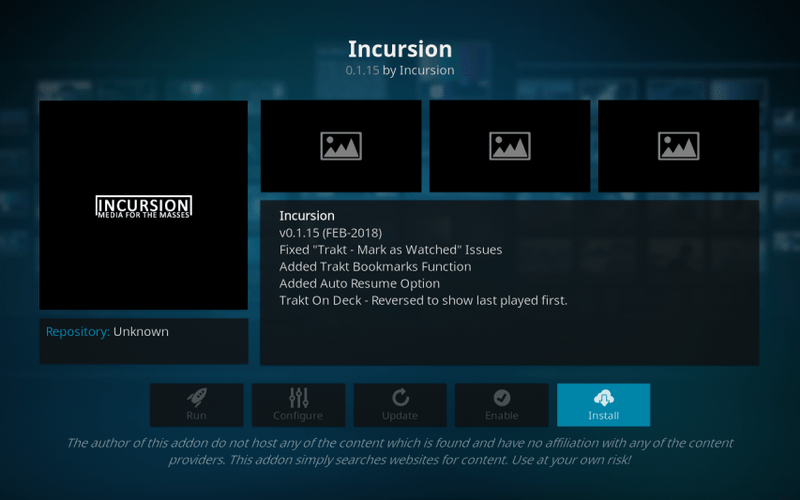 With a solid content catalog and the ability to fetch multiple streams, Incursion can be one of your primary entertainment add-ons on Kodi. It is easy to install and set up and even easier to use. You can get started in just a few clicks.